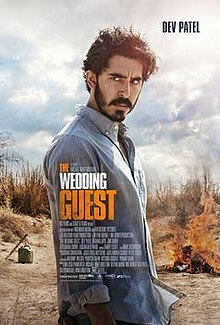 The Wedding Guest is a 2018 British-American action thriller film written and directed by Michael Winterbottom. It stars Dev Patel, Radhika Apte and Jim Sarbh. It had its world premiere at the Toronto International Film Festival on September 8, 2018. It was released in the United States on March 1, 2019, by IFC Films. A mysterious British Muslim man (Dev Patel) goes on a journey across Pakistan and India. In November 2017, it was announced Dev Patel had joined the cast of the film, with Michael Winterbottom directing from a screenplay he wrote. It had its world premiere at the Toronto International Film Festival on September 8, 2018. Shortly after, IFC Films acquired distribution rights to the film. It was released in the United States on March 1, 2019. ^ "The Wedding Guest (2018)". Box Office Mojo. Retrieved April 7, 2019. ^ "The Wedding Guest (2018)". The Numbers. Retrieved April 12, 2019. ^ a b McCarthy, Todd (9 September 2018). "'The Wedding Guest': Film Review; TIFF 2018". The Hollywood Reporter. Retrieved 10 September 2018. ^ Ramachandran, Naman (14 November 2017). "Dev Patel to Star in 'The Wedding Guest' From Michael Winterbottom (EXCLUSIVE)". Variety (magazine). Retrieved 10 September 2018. ^ Sommers, Kat (November 2017). "Casting News: Dev Patel Will Play the Lead in 'The Wedding Guest'". BBC America. Retrieved 10 September 2018. ^ "Beautiful Boy". Toronto International Film Festival. Retrieved July 24, 2018. ^ Vlessing, Etan (July 24, 2018). "Toronto: Timothee Chalamet Starrer 'Beautiful Boy,' Dan Fogelman's 'Life Itself' Among Festival Lineup". The Hollywood Reporter. Retrieved March 2, 2019. ^ Keslassy, Elsa (October 30, 2018). "Michael Winterbottom's 'The Wedding Guest' Bought by IFC Films for U.S. (EXCLUSIVE)". Variety. Retrieved March 2, 2019. ^ Li, Shirley (February 1, 2019). "Dev Patel kidnaps the bride in The Wedding Guest trailer". Entertainment Weekly. Retrieved March 2, 2019. This article related to a British film of the 2010s is a stub. You can help Wikipedia by expanding it. This page was last edited on 13 April 2019, at 05:17 (UTC).